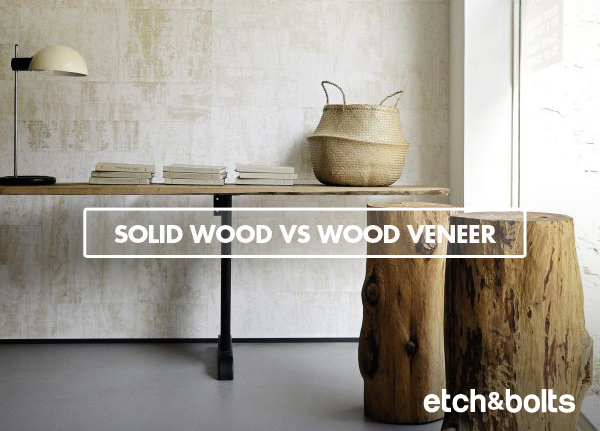 Solid Wood Or Wood Veneer? Having a hard time deciding which wood type qualify for a quality furniture? Don’t fret! With substantial research and experiences in furniture quality control, here’s a list that will ease your load. All exposed parts are made of the same species of all natural wood, with no other materials included, such as plywood or particle board. Highly repairable, if something bumps or falls on a solid wood piece of furniture, or if a part of it breaks completely, it can be repaired. However, if a solid wood dining table top were dinged, the whole top would need to be refinished. You could not touch up just one spot. More time needed for manuafacturing. Susceptible to splitting, cracking, warping and general movement, due to drastic differences in humidity and temperature from the piece’s place of origin to the location with drier climate. See Example of Solid Wood Furniture. Refers to thin slices of wood, usually thinner than 3 mm (1/8 inch), that typically are glued onto core panels (particle board or medium-density fiberboard) to produce flat panels such as doors, tops and panels for cabinets, parquet floors and parts of furniture. Wood veneer on plywood/MDF has better resistant to warping than solid wood. Durability base on the inner wood type (plywood/MDF/particleboard) and the thickness of veneer wood. See Example of Veneer Wood Furniture. 1) Most high end furniture are make of thick veneers on plywood/MDF. 2) Veneer range from 0.6mm, 1.8mm, 2.2mm, 3.2mm – the thicker it is the more durable and fixable longer term the product will be. 3) Do not confuse veneer wood with laminate. 4) The fact that a product is made from solid wood is often touted in advertisements. DO NOT DISMISS VENEERED FURNITURE RIGHT OFF THE BAT. WELL VENEERED FURNITURE WILL LAST FOR YEARS AND IT IS EVEN MUCH DURABLE THAN MOST SOLID WOOD FURNITURE. ← The Art of Maintaining a Good Sitting Posture!